For many patients with MND who have facial or bulbar muscle weakness, standard spirometry with a mouthpiece or tube is inaccurate due to mouth leaks as they are unable to effectively seal their lips around the tube/mouthpiece. Sniff nasal inspiratory pressure (SNIP), and maximal inspiratory mouth pressure (PiMax) may be preferable, but are less widely available and not always successful.2 Mask spirometry has been used but not validated in MND2 and in healthy volunteers, tube spirometry gives greater values than a mask.3 We compared mask and tube interfaces for spirometry in subjects with MND. Consecutive patients were approached in our MND clinic. Exclusions included continuous ventilator dependence, tracheostomy and standard contraindications for spirometry. Bulbar involvement was quantified using the first three questions of the revised Amyotrophic Lateral Sclerosis Functional Rating Scale (b ALSFRS r score) and a score <9/12 defined important bulbar symptoms. FVC was measured with a calibrated hand-held spirometer via a tube or a face mask (Leardal, child No.4) in randomised order. PiMax and SNIP were also recorded by trained technicians (methodology explained in greater detail in on-line supplement). Of 73 subjects approached, four declined consent, nine were excluded and 60, (36 men), mean age 64.7 (SD 10.5) years, were recruited. The mean b ALSFRS r score was 7.8 (SD 3.3) and half the subjects scored <9. The mask was preferred by 44 subjects. McNemar's test was used to compare the number of patients who were able to provide spirometry results with each interface. Successful measurement was achieved for mask spirometry in all 60, tube spirometry 54 (McNemar p<0.001), SNIP 51 and PiMax just 45 subjects. Compared with tube spirometry, the mask gave significantly greater values in those who managed both techniques (figure 1A). The difference was most marked at low volumes (figure 1B), and in people with bulbar symptoms (figure 1C). The six patients who could not record anything with tube spirometry were measured to have a mean FVC of 1.45 (SD 0.68) litres with the mask. (A) Bland–Altman plot showing that mask readings were higher in 36 cases, equal to the tube in one and lower in 17. The mask gave significantly greater values for FVC than the tube, the mean difference was 0.19 l (95% CI 0.07 to 0.31; p=0.0024, paired Student t test). In five subjects, the difference was >1 l (B) Linear regression fitted to predict mask results from tube results gives: Mask (litres)= 0.61+0.80 Tube (litres) (R2=90%). The equivalence line (intercept) is >0 and slope <1, that is estimated mask FVC is higher for low values and lower for high values (above approximately 3 l). (C) For patients with both FVC measurements, the mask value was higher or equal in 21/24 (88%) of cases with bulbar disease, and 15/30 (50%) with non-bulbar disease (Fisher's exact test 0.004). Respiratory muscle strength is a key prognostic factor in MND, and survival is measured in weeks when patients develop ventilatory failure.4 NICE guidelines recommend follow-up every 3 months, but a balance is needed between frequent disruptive clinic visits, and the risk of missing the opportunity to start NIV, which may improve survival and quality of life.4 It is possible that if the measured FVC is artefactually low, patients may be started prematurely on NIV. In Duchenne's Muscular Dystrophy this was shown to be associated with an adverse outcome.5 There are no data for MND, but it would seem to be at least a waste of a resource, and could negatively impact the patient's quality of life. 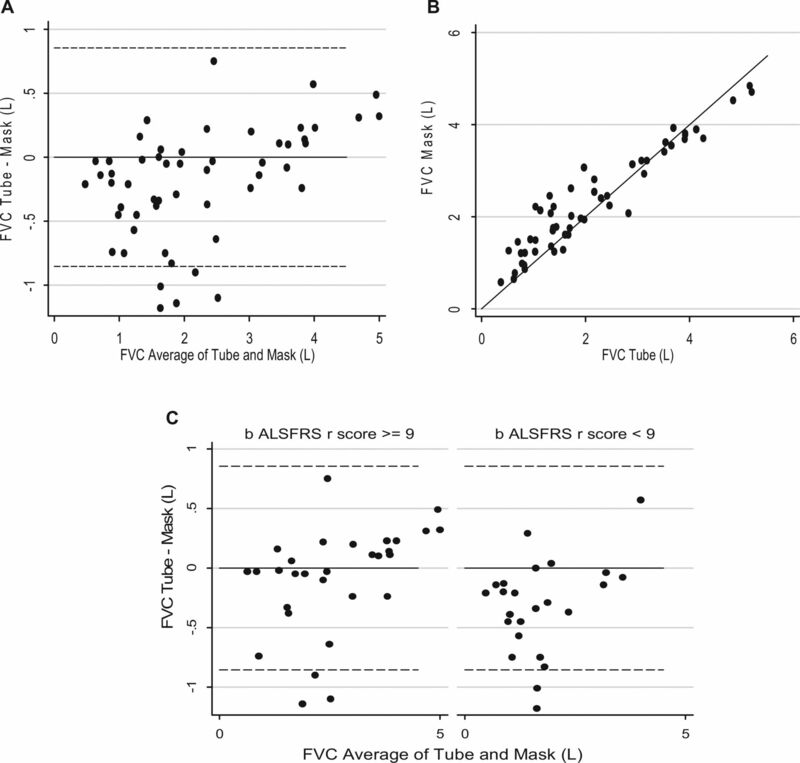 In this study, regression models (figure 1B) showed that predicted mask spirometry measurements of FVC are higher for FVC <3 L, and in patients with moderate to severe bulbar involvement. Mask spirometry was achieved by more subjects than tube spirometry, SNIP or PiMax. Further studies to identify whether mask spirometry has better predictive power for time to ventilatory failure and need for NIV are justified. We would like to thank the Research & Development Department at Papworth Hospital NHS Trust for arranging the randomisation sequences for mask and tube spirometry. We are grateful to all subjects who took part in this study.
. Sniff nasal inspiratory pressure as a marker of respiratory function in motor neurone disease. Eur Respir J 2000;15:539–42.
. Face mask spirometry and respiratory pressures in normal subjects. Eur Respir J 2003;22:1001–6.
. Effects of non-invasive ventilation on survival and quality of life in patients with amyotrophic lateral sclerosis. A randomised controlled trial. Lancet Neurol 2006;5:140–7.
. Randomised trial of preventive nasal ventilation in Duchenne muscular dystrophy. Lancet 1994;343: 1600–4. All authors had full access to all the data in the study, and take full responsibility for the integrity of the data and the accuracy of the data analysis. Contributors SB, MD and IS designed the study and obtained ethical approval. LS completed the statistical analysis and generated the figures. SB, MD and IS co-wrote the manuscript. All authors approved the final version. Funding The research project was funded by a project grant from the Research & Development Department, Papworth Hospital NHS Trust. LS was supported by the Medical Research Council (Unit Programme number U015232027). Ethics approval The study was conducted with approval of the Cambridgeshire III Research Ethics Committee (REC ref. no: 10/H0306/9).